Like most modern-day Canterbury tales, this one begins on February 22, 2011. It begins five kilometres below the earth's surface. It begins with the rupture of a fault line. Like every other resident of Christchurch - then the second-biggest city in New Zealand - it was a day of anxiety for Brendon McCullum, even if he was half a world away from the terrifying earthquake. Minding his own business in a Nagpur hotel room as New Zealand's World Cup campaign started to take shape, McCullum took an early-morning knock on the door from strength and conditioning coach Bryan Stronach, another Christchurch resident. He logged on to various news websites. The pictures were distressing. McCullum rang home to check on wife Ellissa and their two children. The lines were down. For an impossibly long hour he was unable to get through. Nobody in the team could. Then, finally, contact. Everyone was safe. One hundred and eighty-five others were not so lucky. Whole streets were condemned. To use a clumsy analogy, the reverberations from one of New Zealand's deadliest disasters are still being felt by thousands of the city's citizens. "We got off very lightly. I'm under no illusions about that," McCullum said in a phone interview from Christchurch as a cold South Island winter turned slowly to spring. He was stealing a few months at home before a massive home-and-away summer of cricket against Australia. "You can't compare what I went through to others." The next four years would be a time of great renewal, not only for the city but for McCullum himself. This is the story of one man's public rehabilitation, and the part Christchurch played in it. In Phillipstown, an unloved, low-slung pocket of Christchurch, Lancaster Park rises shabby and lonely - a pitiful symbol of the devastating power of the earthquake. The Hadlee Stand, which connected the region's most famous cricketing sons to the ground, was demolished. The Deans Stand still stands, but so strong was the tremor, it lifted the massive concrete piles upon which the structure is mounted and dropped them at the wrong angle. Stands can always be rebuilt, but it was the grey syrup from the liquefaction that oozed through the surface in the immediate aftermath of the quake that effectively ended the ground's viability. Truth be told, it was a dreary, misshapen cricket park. Established in 1880 as the home of Canterbury cricket, it had been squeezed over the years by rugby's stranglehold to the point where the square boundaries greedily accepted top edges and mishits. Tests had become so poorly patronised that the five-day game hadn't been played there since 2006, as New Zealand Cricket (NZC) shifted its emphasis away from near-empty concrete jungles to low-capacity "boutique" venues like the Basin Reserve, Seddon Park and University Oval. Even before the Big One, former New Zealand captain and now Canterbury Cricket CEO Lee Germon had started agitating for change. He wanted to develop a corner of Christchurch's most celebrated green belt, Hagley Park, into a first-class and Test venue. Opposition was well organised and strident. Hagley Park was part of the city's heritage. It was designed to serve one and all. Sealing off a section for cricket would defy, perhaps even defile, the park's egalitarian purpose. The earthquake, however, and the impending cricket World Cup had pushed the project up the agenda. Civic leaders and the central government knew they were facing a PR disaster if Christchurch was omitted from the World Cup itinerary, so plans for the ground bypassed City chambers and went straight to the Environment Court, which eventually granted consent. 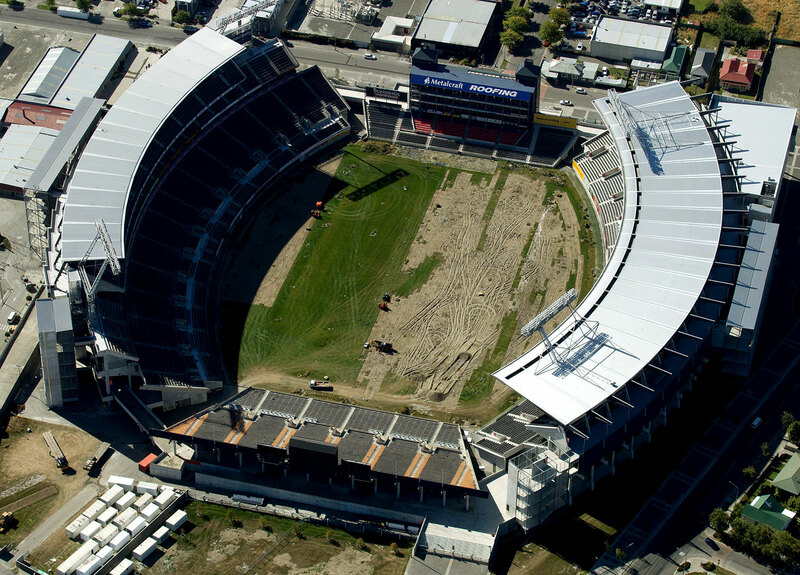 "It was almost the perfect legacy project in terms of the World Cup," NZC chief executive David White says. The ground would have to be "road tested" before the World Cup, so NZC spied an opportunity and scheduled a Boxing Day Test against the touring Sri Lankans. When McCullum woke up and drew the blinds on December 26, 2014, he was caught in two minds. McCullum is a bat-first sort of guy. He hates handing the initiative to the opposition unless conditions absolutely dictate. He had learned the hard way in his first Test after being appointed captain, when New Zealand were rolled over by Dale Steyn, Vernon Philander and Morne Morkel for an embarrassing and ultimately cleansing 45, that being dogmatic about these matters was unhelpful. Still, he knew a thing or two about New Zealand wickets and that they no longer deteriorated but tended to get quicker on days two and three. That would suit his seam quartet of Trent Boult, Tim Southee, Neil Wagner and Jimmy Neesham, but it would also mean choosing to bat first on a wicket that had a green tinge. If he could have read the thoughts of Germon, who was pacing the ground, putting the final touches in place, he would not have been any more confident. "The last thing we wanted was for the Test to last two days," Germon says. "That would have been a disaster. I had confidence in the ground staff to prepare a good wicket, but it hadn't always been easy to bat on and that did go through my mind." 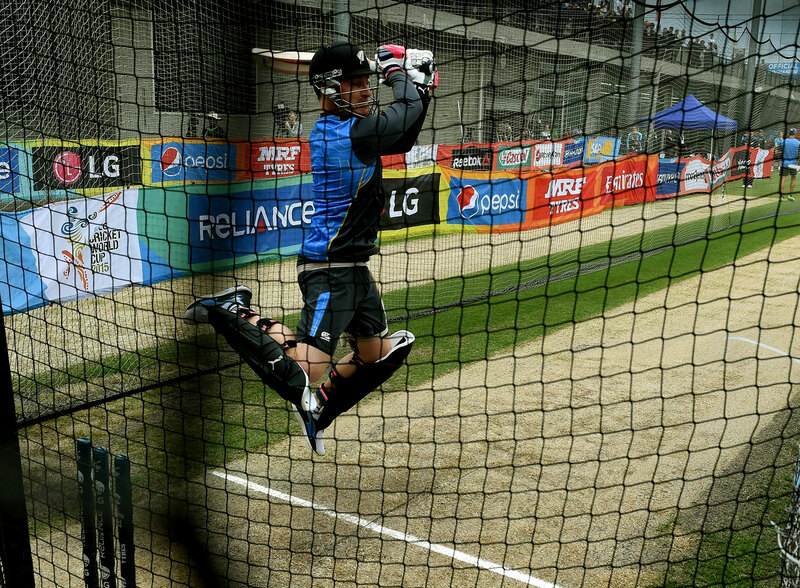 On reaching the ground, McCullum was no closer to firming up his thoughts. "I decided it would be a good toss to lose. It was just one of those occasions." As McCullum gazed around the ground he "sensed a big occasion - it just felt different". He wasn't a child of Christchurch as such, but had moved to the city in 2003, shortly after his parents had also made the move north from Dunedin, to play for Canterbury. He'll always be a South Dunedin boy, but on that sunny, warm morning, with Christmas excess still being digested and people coming from all points of the compass, he was pretty proud to call Christchurch home. An hour before the first ball was due to be bowled, there were queues of people lining up at the gates. For Test cricket. In New Zealand. In this most conservative of cities, a buttoned-down town that had endured close to four years of painfully slow progress, there was unbridled joy at the prospect of 22 men in white playing a stick-and-ball game on a public holiday. Germon had one last duty. He had to hand out caps to the players and talk a little bit about what their presence meant to his city; about how none of his four children had yet had the opportunity to watch a Test in Christchurch. "I think something got caught in my eye," he laughs at the recollection. "He was crying," McCullum says. "That's when it really hit home how much it meant to the people here. There was definitely the sense that this wasn't an ordinary Test." Oh, and McCullum lost the toss. Job done. Angelo Mathews invited New Zealand to bat. By the middle of 2011, McCullum was embarking on a "second" career in international cricket. While his Test record as a wicketkeeper-batsman was superior in New Zealand terms to that of anybody who had come before him, his knees and back had deteriorated to the point where the only way to prolong his career was to drop the gloves and take his chances as a specialist batsman. The last time that had happened was at the very beginning of his career, when, as an older-than-he-looked 20-year-old, he was taken to Australia as an opener for a one-day tri-series also involving South Africa… and was promptly spat back out. In his first series as Test opener, in 2010, he scored a reassuring double-ton in Hyderabad. But the batting was only one part of the riddle. The captaincy was a more complex matter. It would require a book to document the tortuous ins and outs of New Zealand cricket between 2008 and 2012, but an idiot's guide would go something like this. From the time the occasionally promising, mostly maddening John Bracewell era ended in late 2008 to Mike Hesson's appointment in 2012, New Zealand burnt through three coaches and a whole lot of goodwill. McCullum had been vice-captain, then sacked. It was made public he had been dumped in the days after Andy Moles was left with no choice but to resign as coach when it became obvious the players no longer backed him. In other words, the cricket public was left to draw the conclusion that McCullum was a ringleader in the move to oust Moles. A concerted whispering campaign was also being conducted in the background, suggesting that McCullum had an aversion to early nights and was having a malign influence on younger players. Ross Taylor replaced McCullum as vice-captain, but when Daniel Vettori stepped down as captain following the 2011 World Cup, the pair was involved in a disastrous presidential-style run-off for captain. The process was window-dressing. McCullum never stood a chance. The coach at the time, John Wright, and director of cricket John Buchanan - a match made in hell - both backed Taylor, who they saw as a safer pair of hands. Taylor was a popular choice. New Zealand's most talented batsman since Martin Crowe, he was a fan favourite and was seen as less mercurial than McCullum, who found it difficult to shake off the impression that he was a talented maverick and a compiler of cameos. Wright's tenure as coach, however, was short and largely unfulfilling. He picked a fight with Buchanan and didn't reapply for the role when his contract was due for renewal. Step forward Hesson, McCullum's former coach and, briefly, Otago B team-mate. Early in his tenure, during a tour to Sri Lanka, Hesson decided a change of on-field leadership was needed. Facts and speculation are so deeply tangled it is pointless relitigating it; suffice to say Hesson either informed Taylor he would be replaced as the limited-overs captain (Hesson's version), or captaincy altogether (Taylor's version). It was an ugly end and the public uproar came ashore like a tsunami. When McCullum was appointed captain the New Zealand public, fuelled in large part by ex-players who were suddenly everywhere in the media, embraced the classic good-versus-evil plot line. The team left for South Africa, sans a shell-shocked Taylor, with metaphoric boos ringing in their ears. Winning the toss and batting on a spicy Cape Town wicket was, in retrospect, a foolhardy way to start one's captaincy tenure, but in the wake of that humbling 45 and eventual innings loss, a catharsis took place. Philander, Morkel and Steyn had unwittingly done New Zealand a huge favour: they had reduced the Blacks Caps to their ground zero. Hesson, McCullum and manager Mike Sandle met after the Test and talked about how the team was viewed by their compatriots. The perception, they determined, was that New Zealanders saw them as overpaid, underperforming prima donnas. Perception, in this case, they had to treat as reality. From this point forward they were going to do everything to win the public over. They would do it by playing an exciting, attacking brand of cricket, by playing hard but fair. They would learn to be as humble in victory as they had been forced to become in defeat. There is something inexplicable about Kane Williamson and Taylor. They both average in the mid-40s, have already surpassed Andrew Jones and Martin Crowe as New Zealand's best ever three-four batting punch, and they enjoy batting together. "I wouldn't swap them for any other combination in the world," says McCullum. They are both quick and read the game well, yet when they run between the wickets you get a sense of what cricket would look like if Monty Python had invented it. "The old Williamson-Taylor running combination, if we knew how to fix that… " McCullum says ruefully. "It's a strange thing." At Hagley Oval, as lunches are just settling into stomachs, the curse strikes again. Taylor is run out for seven, sold down the river by his partner (don't worry, he'd get his own back in the one-day series that followed). New Zealand have just 88 on the board, three wickets are down. 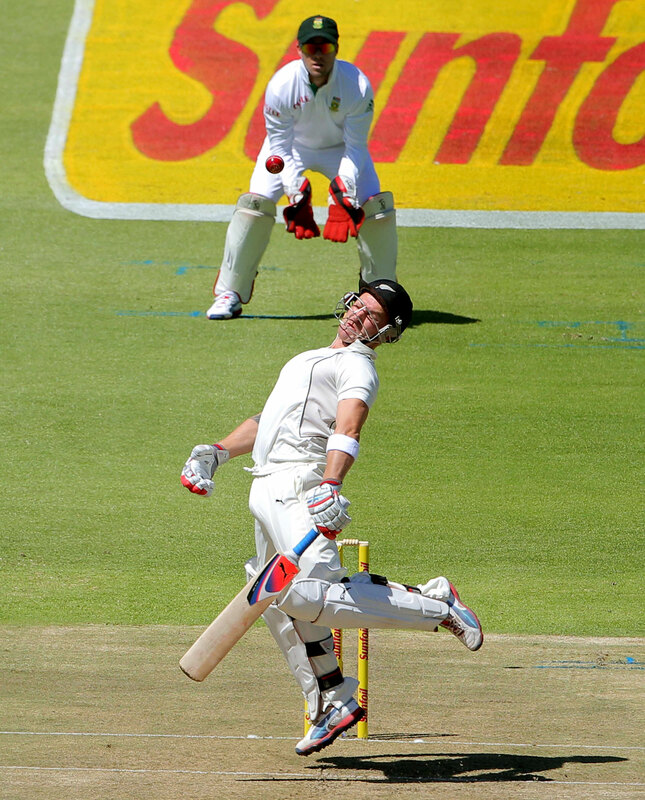 Williamson looks set on 34, but this is a tricky time; one of those knifepoint moments that define Tests. Another quick wicket or two and you're suddenly looking at a sub-200 total. McCullum strides to the wicket and sees out the remaining two balls of Shaminda Eranga's over. "All I'm thinking about is trying to watch the ball. People might not believe this, but most of my preparation for batting is geared around defence. If I can rely on my defence - defend straight and leave well - then the rest of my game flows from there." McCullum and Williamson set about building a partnership, something they had done to astonishing effect in the previous Test, against Pakistan in Sharjah - the weirdest, most fraught and arguably the most important Test this generation of Black Caps will play. That was the Test, played to nobody, that was postponed for 24 hours after day one following the death of Phillip Hughes. "It felt like he was one of us," McCullum recalls. "It was this horrible feeling of knowing it could have been any one of us. We didn't want to continue. I was looking around the sheds and thought there was no way we could get these guys in the right space to play cricket." Cancelling wasn't an option. NZC instead put support around the team and renowned mental skills coach Gilbert Enoka became involved. In the wake of Cape Town, the Black Caps had based their culture on a team-first policy but Enoka told McCullum to strip all that away for the remainder of the Sharjah Test. He told the management to get alongside individuals - like Williamson, who had formed a friendship with Hughes during an Under-19 World Cup - and make sure there was no lasting damage. He suggested that the players, in essence, could be self-absorbed for a Test. "It sounds a bit dramatic in hindsight, but those were the feelings at the time," McCullum says. 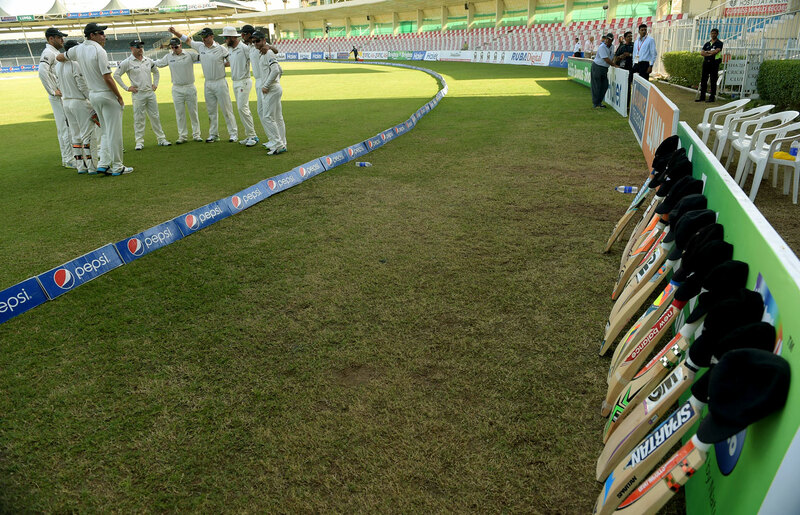 When the Test resumed, Pakistan were 281 for 3 batting first. By the end of day three, with no play on day two, New Zealand were a staggering 249 for 1, trailing by just 102. McCullum, who opened, was on 153, having recorded, from 78 balls, the fastest Test century by a New Zealander, and Williamson was on 76. 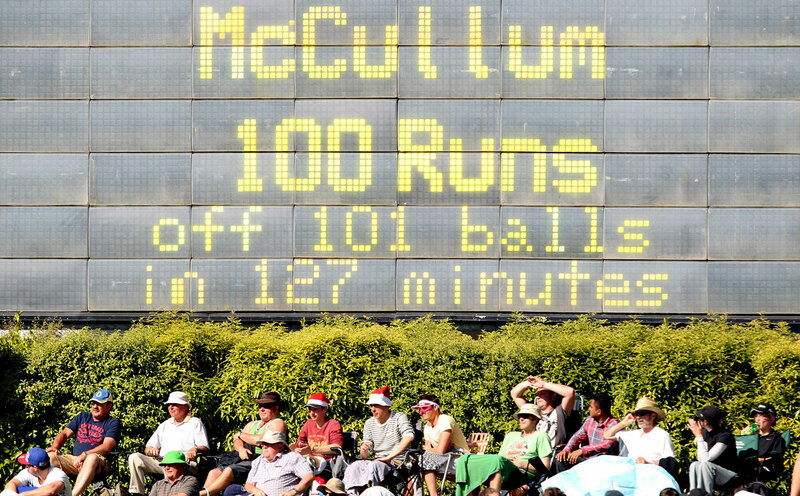 McCullum would go on to 202, his third 200-plus score of the year, Williamson to 192. The partnership was worth 297 and New Zealand would win the Test by an innings and 80 runs. "What you saw was a team playing without feeling," McCullum says. "What we learnt was that when you play without any of the pressures and expectations we normally put on ourselves, your skills can be properly expressed." The circumstances could not be replicated, not that you would want them to be, but McCullum realised there was stuff from Sharjah that could be bottled. Like playing cricket for cricket's sake, not because it could make you rich and famous, or because it was what your schedule said you had to do, or because you wanted to prove to the other team what a big man you were. McCullum's thoughts on the nebulous spirit of cricket also crystallised in Sharjah, particularly around the issues of sledging and on-field confrontation. Because nobody was in the mood, there were no over-the-top celebrations of batting milestones or wickets, no bowlers getting in the face of batsmen, no displays of petulance. They were just 11 cricketers trying to enjoy the sport for what it was - a game. The senior players talked a lot about cricket and what it meant to them that week. Big-picture concepts were discussed. They realised that New Zealand had never really tried to carve their own cricket identity. For the first 60 years after receiving Test status, they had tried to be like England. The best players made a living in county cricket and would come back for the summer and shape the thinking around the way the game was played here. When the doors to county cricket all but closed, because of year-round international schedules and the availability of Kolpak players, and a new generation of New Zealand players thought that England was, well, a bit crap, they went in the other direction. They tried to play like Australians, all dog-eared and hard-bitten. That was fine when they were winning, like they were for a while when players like Stephen Fleming, Nathan Astle, Craig McMillan, Chris Cairns and Dion Nash were in their pomp. But when they weren't, they just looked, as they'd say down this way, like d***heads. "Most of it emanated from us being semi-embarrassed about the way we had played in the past," McCullum says. "It has to be authentic and it may not last - you can't force it down people's throats - but this is the way I want this team to play and I know the senior guys have similar feelings on it." Sharjah is a long way from his mind, however, as he starts to get in at Hagley Oval. On 27, Mathews pitches one up and McCullum smashes it over mid-off for six to become the first New Zealander to score 1000 Test runs in a calendar year. He soon goes on the charge, hitting his second, third and fourth sixes in quick succession. He ends a dramatic 45th over on 92. An NZC staffer, seeing McCullum's son having a knockabout with his mates on the wrong side of the bank, yells out: "Hey Riley, come and watch your dad, he's about to get the fastest Test century for New Zealand." McCullum hits debutant spinner Tharindu Kaushal for a single off his 71st delivery. On his 72nd he attempts a reverse sweep and it runs away for two leg-byes in the midst of a huge shout for leg before. Sri Lanka review the not-out decision but Hot Spot shows an edge before it hits the pad. Seeing that, McCullum and the scoreboard operators assume he is on 95 and when he smashes Kaushal far over long-off for six he raises his bat to all in the ground. "It wasn't an overly exuberant celebration, which is just as well," he says. What he didn't realise was that the DRS had confirmed the decision on the field, which was that the leg-before appeal was not out. It didn't adjudicate on the decision to award leg-byes. He remains on 99, a score he has fallen on before, but pushes the next ball to vacant point, gets a quick hug from Williamson on 52 (who was on 34 when McCullum joined him), before settling back to business. Three balls later Williamson, who has been strangely sketchy, is dismissed. And the ebullient allrounder Jimmy Neesham joins McCullum at the crease. As a case study, Neesham is a perfect example of the leaps and bounds the Black Caps have made under Hesson and McCullum. Without an injury to Corey Anderson, Neesham might never have got a chance, but in eight Tests he has averaged a tick over 43, scored two centuries - one on debut as McCullum scored a triple-century at the other end - and taken 11 wickets at 33 apiece. "He's already overcome some big challenges," McCullum says of Neesham's serious back injury, "but he's a relaxed character and he seizes big opportunities. He's a very good cricketer." It is hard to recall any high-profile New Zealand sportsman whose public image has been as complex as the relationship between McCullum and the noisy minority, with the possible exception of code-hopper and current All Black Sonny Bill Williams. In the winter of his career, McCullum has morphed into an inspired and inspiring captain, an almost incandescent presence at the crease who has compiled monster Test scores, a believer in the spirit of cricket, and an admired figure in world cricket. All the while he has struggled for universal acceptance. 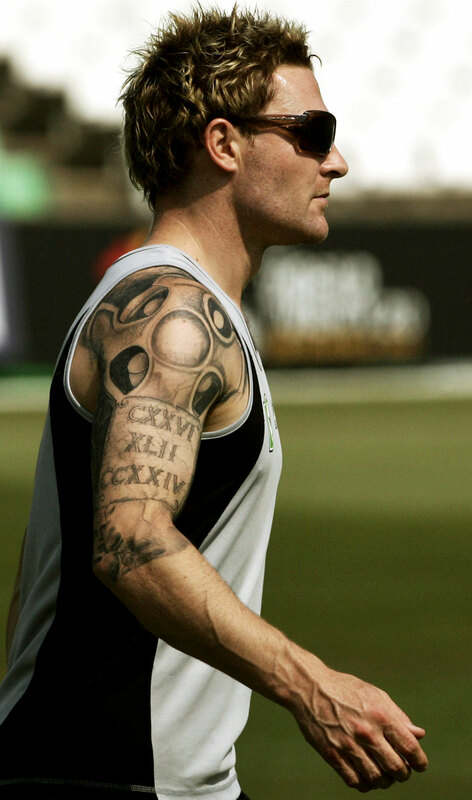 Documentary-maker, media personality and cricket tragic Jeremy Wells has a theory that McCullum's tattoos play a part. He calls it the "Ink Effect", and while it might seem outlandish in this age of heavily tattooed sportsmen, New Zealand is still held upright by a conservative backbone. In 2014, McCullum was named New Zealander of the Year by the country's largest newspaper, the New Zealand Herald, as much for his stance against match-fixing as for his monster scores against India, yet there is still a sense that pens are being sharpened for the McCullum downfall. "I think with Brendon, what happened was that he played in a time of extraordinary change for cricket," says NZC chief executive David White. "T20 was kicking off. The Indian Premier League was introduced and Brendon was immediately successful in that domain. People's perception was that the IPL was all about money and, unfairly in my opinion, associated him with the excesses of that tournament." McCullum the greedy showman - it is a description John Cushen struggles to reconcile with the boy he first saw as a dressing-room urchin during his Otago playing days (Cushen was a team-mate of Brendon and Nathan McCullum's father Stu), before coaching him at King's High School. Cushen says King's was not a place where ego flourished. It was an all-boys school that serviced the blue-collar suburbs that made up South Dunedin. "It was working-class families down there," Cushen says. "The ones whose parents couldn't afford to send their kids to the [former Pakistan international and long-time Dunedin resident] Billy Ibadulla coaching schools. When I'd take Otago U-16 and 18 teams, it was all John McGlashan College and Otago Boys' High kids. There weren't many boys from King's." Then one day, a "tiny little runt" he recognised walked through the gates for his first day of high school and a lifelong friendship was born. McCullum barely had the size or strength to reach the boundary, but the boy could keep wicket like he was born with gloves on the ends of his arms. "I rang Stuey up and said I wanted to pick the wee guy in the first XI at the end of his third form year [first year of high school]. I wanted to make sure he was okay with that. That was very unusual. While I was there at least, no other third-former had come close to getting a look-in. "He batted down at nine or ten, but he had a great attitude. I remember, once we were playing Southland Boys' High and it was a close game, but we got down to our last wicket and needed 16 runs off the final over to win. In those days, the thinking was, if you can't win, then you don't bloody lose. I sent out the call to see off the last over. Baz was going, 'I can do this. I can do it.' I said, 'No, you won't.' He listened, but that was him to a T. Even at that age there was nothing he didn't think he couldn't do." Even when McCullum progressed through school and quickly established himself as the best cricketer and, probably as notably, the best rugby player, Cushen said he never lost his ability to communicate with the younger guys. "They loved him. You couldn't help but like him. I remember when guys like [Martin] Crowe and Mark Greatbatch first came into the Auckland senior team and we made it difficult for them, made them feel like they had to prove themselves, and they didn't enjoy it and left. Brendon wasn't like that. He included the younger guys in everything right from the start and made them feel valued." Cushen, who played 69 first-class matches for Auckland and Otago over two decades, is not known for hyperbole. A hyper-aggressive medium-fast bowler, he was known to run through the crease and let the batsman have one from 18 yards if he felt he was taking liberties. He prefers to defend rather than attack, however, when the subject of the character of one of his favourite pupils comes up, like when a reporter rang him in the aftermath of the Ross Taylor Affair and referred to McCullum as "the rat in the changing room". He can reel off a list of anecdotes that demonstrate what he believes is the essence of the man. Like the time when a Test finished early at Dunedin's University Oval, so early that it would be another four or five hours before Cushen was getting picked up to be taken the three hours back to his Queenstown home. "He came and sat down with me and a few other old codgers. I told him to bugger off and go back into town and celebrate with his team-mates. He wouldn't have anything of it; he sat there and kept me company until my ride turned up. He remembers every person on every rung of the ladder who helped him get to the top." When McCullum took over from Taylor as captain, things got personal. A loose collection of ex-players and cricketing personalities, including some media, became involved in a movement known as The Parker Group, named after its "leader" John Parker, a former pro of the 1970s and '80s. While Parker maintained the group sought fundamental change in NZC's structures, it was clear from their correspondence that their real targets were Hesson and McCullum (to the point where Parker eventually retracted a statement he had made and apologised to McCullum under the threat of legal action). The Parker Group was really only serving what had become the popular narrative: that Hesson was a coaching fraud and McCullum an opportunistic and undeserving captain. "F*** yeah, it was horrendous for a while," McCullum says. "Trying to retain a sense of perspective when you're under fire is not easy, but in the grand scheme of life, it's not that important. One of my mates has a wife who is battling leukaemia. What I went through is nothing compared to what they're dealing with. He told me: 'Tough times don't last; tough guys do.' Sometimes you've just got to drop the shoulder and push through the pain. "It's just a game. Sure, you try your arse off and leave everything on the park, but if it doesn't work it doesn't work. I guess I've tried to get the team to recapture some of that innocence." But surely he has used the knockers as motivation? "There might have been a bit of that, but not now. To be fair [to my critics] I probably gave them reasons to [not like me], but I've grown up a bit as well. I don't harbour any ill-feeling towards them. I don't resent them in any way." New Zealand cricket has been as much damaged as defined by its leaders. Captains came, captains went, some good, most indifferent, but all burdened with either an in-built sense of inferiority or lumbered with bad stock. Then came Geoff Howarth, outwardly calm and urbane, who took the lessons learnt from the County Championship treadmill and convinced a dressing room that they could compete with anyone. With Richard Hadlee at his peak and a young Martin Crowe flowering, it was a time of prosperity for the national side. Howarth wrote a chapter that is all too readily erased by those who didn't like the man, but it shouldn't be. He ushered in an era of confidence that was gradually whittled down until Fleming, McCullum's former player-manager, who has retained close links, grew into the role and offered fresh hope. But even those two pillars of the post-Packer landscape never came close to creating the sort of buzz that McCullum and his team have done in the past 12 months. The World Cup surpassed even 1992 for public buy-in. McCullum was overwhelmingly regarded as the captain of the tournament. It is not going too far to say he restarted the conversation about how to play one-day cricket. He kept a slip cordon, he bowled his best bowlers out by the 30th over. Like a brilliant conman - perhaps a bad choice of word - he fooled the opposition into thinking New Zealand were well on top, even when they weren't. "Sure, you try your arse off and leave everything on the park but if it doesn't work it doesn't work. I've tried to get the team to recapture some of that innocence"
It is tempting to say his greatest trick was making his team-mates believe they were the best players in the world, but it wouldn't be fair, because he actually believed that himself. As allrounder Corey Anderson said in a recent documentary, the Black Caps would have, by the end of the tournament, "walked into fire" for him. There is a special kind of mayhem when McCullum is batting and in the zone: the feeling that every ball could result in any one of three things - four, six or out. Once he passes the century mark at Hagley Oval, he's in that zone. If his batting was brutal before, it's apoplectic now. One over from paceman Suranga Lakmal reads: four down the ground; six over long-on; straight six; dot; four flicked off the pads through midwicket; six over long-off. The 300 comes up in the 57th over. Eighty-eight for 3 after 24 overs must now seem like a cruel tease for the tourists. McCullum faces up to Kaushal in the 66th over. He is on 183. He starts to think about 200. "A triple and three doubles in a year would have been nice," he says. Instead he goes six, dot, two, four and… caught on the long-off boundary. There is a collective moment of quiet disbelief, where time seems suspended, and then every person in the ground rises to salute an innings for the ages. This was a goosebumps moment. When McCullum scored his 302 at the Basin Reserve earlier in 2014, he won respect and admiration from most, but not all, of his harshest detractors. He didn't cry because, he said, it wasn't what boys from South Dunedin did. When he left Hagley Oval after his 195 it was less like respect and more like genuine affection. Maybe, just maybe, trying to hit a six to bring up his 200 when five singles were gladly being offered added to the legend. Glenn Turner would have taken the singles, as would have Crowe and Taylor and Williamson - all the giants of New Zealand batsmanship. Where they would have seen a rare opportunity for a significant milestone, McCullum saw an inexperienced spinner, a tailwind and a short boundary. In his world, why wouldn't you take it on? 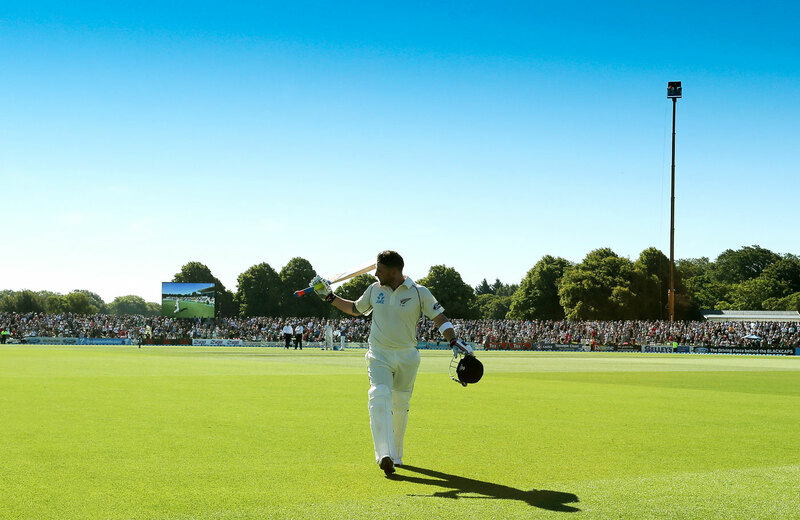 "I'm never going to go down as a great player or have great stats," McCullum says. "I spent too much time worrying about numbers when I was younger, but then I realised stats can tell you what you want to hear. I enjoy following other people's statistics, like Kane and Ross', more than mine. What I'm most proud of is that I've learnt from my mistakes. I've changed from a keeper-batsman to a batsman and I've got better." New Zealand closed on 429 for 7 that day. Cantabrians spilled out of the ground, got into their cars and weaved their way through their broken city to their homes. And they came back again the next day, when Boult, Southee, Wagner and Neesham ripped through the Sri Lankans for 138 to enforce the follow-on. And they came back the next day too, when Dimuth Karunaratne scored a rearguard 152. And on the fourth and final day they watched Boult and Southee take four apiece, and Williamson and Taylor - no run-outs this time - pace the team through to an eight-wicket victory. They hadn't seen Test cricket in the city for close to nine years, but they started to appreciate what the rest of us had known for some time: New Zealand had a team that makes cricket fun to watch again. The trouble with history is often its historians. Too often those who document its course reach too far; try too hard to imbue a sense of occasion that wasn't really there. So let's make something very clear: McCullum's New Zealand did nothing to alleviate the after-effects of Christchurch's devastating natural disaster. They did not save a life; they did not repair a school, a house or a church. They didn't do anything extraordinary, really, except the thing they are paid to do. Nor should we suggest that McCullum is a perfect captain, or a flawless character. He is not. In his own words, he is not even a great player. For one perfect day, though, his instinctive, inconsistent brilliance shone a light on a city on the mend. And if it felt like something more than an innings, if it felt like something more than a day at the cricket, well that's fine too. "For me, Brendon's innings embodied the spirit the city had shown since the earthquake," Germon says. "It was an innings of courage, of fearlessness. It symbolised our resilience. That might be overstating it, I don't know, but that's how I feel."